Also a major motion picture! 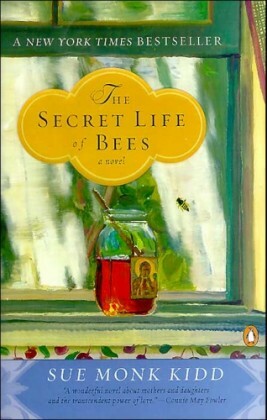 I have to be honest, I attempted to start “The Secret Life of Bees” by Sue Monk Kidd twice in the last several years and each time I found myself not able to continue reading each time. but I am going to give this book a third try before I completely give up on it. Now, like I believe I mentioned before, I won’t start a book with this blog and not finish it, so you can be sure I will finish the book this time around. I also don’t mean to deter any of you from this book either, I am sure I will enjoy it or at least respect it in the end and I encourage you to follow along with me this month! The story is set in South Carolina in 1964, and tells the story of Lily Owens, whose life has been shaped around the blurred memory of the afternoon her mother was killed. When Lily’s fierce-hearted black “stand-in mother” Rosaleen insults three of the deepest racists in town, Lily decides to spring them both free. They escape to Tiburon, South Carolina – a town that holds the secret to her mother’s past. Taken in by a trio of black beekeeping sisters, Lily is introduced to their mesmerizing world of bees and honey, and the Black Madonna. This is a remarkable novel about divine female power, a story that women will share and pass on to their daughter’s for years to come. I’m so sorry that you can’t seem to get into this book as it was my favourite book of that year!! I will however, admit that her second book “The Mermaid Chair” was a stinker, but “The Secret Life of Bees” was fabulous. Perhaps once you get into it a little more you’ll begin to enjoy it. At least I hope so because it is a very special story. Good luck to you. Thank You! I figured I might as well give it another try! So far it isn’t too bad. So we shall see. Thanks though!